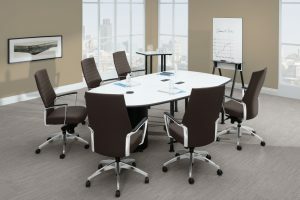 If you’re in need of corporate furniture for your new or growing business in East Cobb, Georgia, or a neighboring community, turn to the professionals at NorthPoint Office Furniture. Since 1994, we have provided companies throughout the Metro Atlanta area with premium new and used commercial furnishings. At our 8,000-square-foot showroom, you’ll discover an extensive collection of beautiful and modern pieces that will enhance any office, as well as fully staged displays that will allow you to see how the furniture will look in your space. At NorthPoint, we want to make sure our customers have a positive experience with us, so we go above and beyond to ensure their complete satisfaction. Once you’ve selected the corporate furniture you’d like for your office in East Cobb, the team at NorthPoint can provide you with layout ideas and planning suggestions to help ensure that you get the most optimal use out of your space. We will even deliver and assemble your furniture for you at no additional charge. What’s more, all of our corporate furniture pieces are backed by generous manufacturers’ warranties, so you can rest easy knowing your investment is completely protected. To learn more about the corporate furniture we have available for businesses in or around East Cobb, GA, call NorthPoint today.